There is enough scientific evidence of a link between chronic diseases as e.g. 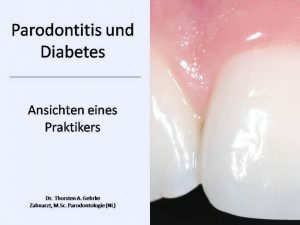 diabetes and periodontitis. Dr Gehrke provided an evening lecture in berlin in october 2014 in front of general physicians showing evidence and cases from literature and his own experience as private practitioner. since 2010: we are one team – Dr. Gehrke and Mrs Busse-Gehrke and our teams. Mrs Busse-Gehrke is dentist as well – for years already – and has her major focus on root canal treatment and restorative dentistry – so we are able to do even better to save your teeth. Furthermore, office will be open also wednesday afternoons. With Maurizio Tonetti and Pierpaolo Cortellini two italians were showing “l’accuratezza” in periodontal therapy (surgery) in front of an audience of more than 450 colleagues. 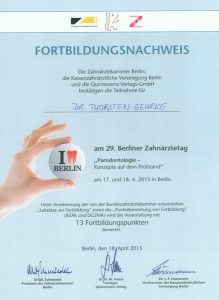 This conference was organized by the German society of Periodontology and hosted in Berlin.